Sometimes last year's phone is still a good choice even with newer models tempting you from the shelves. We've now reached a point of technological advancement that a well-made and powerful year-old phone is plenty good enough for today. This is especially true if you're looking to buy a phone on a budget, since once the next generation of a phone appears, the old version goes on sale. Now that the Galaxy S4 is out, you can find the Galaxy S III at every carrier for a nice discount. I've extensively tested all four major carrier versions and would recommend any of them, but T-Mobile's deal is one of the best: $20 down and $18 per month for two years. For that low up-front cost, you get a device with a great screen, slick design and tons of features. It's the best budget smartphone available on T-Mobile. The design wrapped around the Galaxy S III's 4.8-inch display offers a nice balance between a big screen and one-handed usability. The curved edges make it comfortable to hold, as does its light weight. The display boasts a 1280 x 720 resolution, rich colors, terrific contrast and wide viewing angles. Small text is crisp, and no matter how you hold it, you'll get a good viewing experience. I'm not as down on plastic phones as some other reviewers. I appreciate the benefits plastic brings, such as a removable back for accessing (and changing) the battery and microSD card. This is important if the battery starts to lose longevity. Still worried about the fragility of plastic? Since the this was such a popular phone, you won't have trouble finding cases and other accessories. Under the hood, a dual-core processor and 2GB of RAM make for speedy performance and smooth multitasking. This combo is good enough for the majority of non-game Android apps. High-end games may get to be too much for this phone over time; right now, there are very few apps that it won't run well. T-Mobile only offers the 16GB version of the phone. The microSD card slot accepts up to 64GB, so there's plenty of room for music, photos, and other media. The S III is 4G LTE-ready and falls back on HSPA+ (faster than 3G) when not in range of LTE. Other wireless connections: a/b/g/n Wi-Fi (Wi-Fi Calling is available, too), Bluetooth 4.0, GPS, NFC, and mobile hotspot capabilities. Even on LTE, the Galaxy S III gets great battery life that lasts all day, even if the day is long. The S III's 8-megapixel camera is decent, especially for a phone at this price. While not as good as the iPhone 5's, you can coax good pictures out of the phone thanks to the robust camera app. There are a ton of Samsung-only features here and more sharing options than you likely need. The images and video from the S III are good enough for sharing online and on the screen. The S III currently runs Android 4.1 Jelly Bean with Samsung's extensive skin/user interface (TouchWiz) on top. At its best, TouchWiz makes Android a bit easier to use, especially for newcomers and less tech-savvy owners. Some of the features go a little far, but most are easily ignored if you don't want to use them. 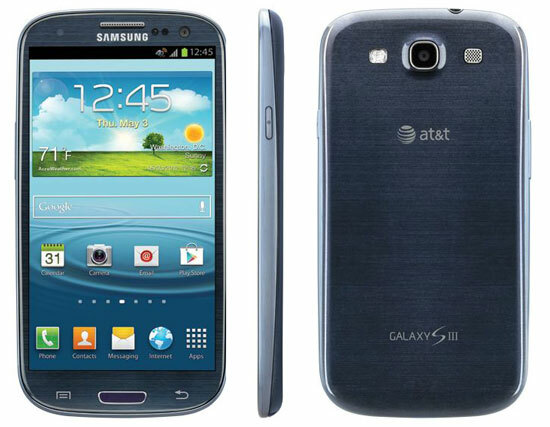 The Galaxy S III proved very popular with customers and with reviewers. Many agreed that Samsung did a good job of keeping the overall size small even with a big display. "I have small hands and I feel comfortable using a phone of this size," says GigaOM's Kevin C. Tofel. Mark Spoonauer of LaptopMag agreed, saying the phone is "comfortable to use despite the huge screen." GigaOM likes having the hardware buttons on the bottom because it "makes the interface easier to use: Buttons are easy to hit and I find typing on the software keyboard a better experience too." On the construction and build, Casey Johnston of ArsTechnica dismissed reviewers who say the S III feels cheap: "... aside from the thin snap-on-snap-off back cover, it feels solid, sleek, and light for its size, compared to the denser iPhone." The large number of features daunted many reviewers. In the end, many agreed with LaptopMag that "most of Samsung's additions are welcome, though you'll have to dig to activate or tweak [them]." The huge number of sharing features got a positive nod from GigaOM and ArsTechnica, and Spoonauer gave the thumbs up to the gesture-based controls and overall usability: "[T]his Android device impresses because of its slim design, good battery life, and fast 4G speeds but especially because of its intelligence." Galaxy S III owners on GDGT.com are generally happy with their purchase. They cite the display, design and media support among the best things about the phone. The Google Nexus 4 is also only $20 down on T-Mobile. People who like Android without any extra apps or skins or other things cluttering up a "pure" experience will appreciate the Nexus, designed by LG. The Nexus also gets Android updates much faster than the Galaxy series. The Nexus has a vivid, bright screen, fast performance, a good camera that can take 360-degree panoramic photos and long battery life. It isn't as holdable as the Galaxy S III, and since the battery is sealed in, you won't be able to replace it yourself. There's no microSD card slot, either, and the Nexus is not LTE-capable. If you live in a city without LTE, this won't make a difference, but T-Mobile's LTE network is growing fast, and you don't want to be left behind. Everything that made the Galaxy S III a popular phone last year makes it a great entry-level phone this year. The comfortable design, great display, decent camera and speedy performance will hold up another two years, at least. And for $20 down, there aren't many other Android phones on T-Mobile that even come close to its value. I agree with the first poster! Under $50 is just the down payment. And if your credit isn’t the greatest, there is no such offer, you have to pay huge up front! It’s true that the phones we picked for these best under $50 pieces are only that low price for the down payment/initial cost, but for better or worse that’s the way smartphone pricing works. Not just at T-Mobile but any carrier. T-Mobile is just more upfront about it, separating the cost of the phone from the cost of the plan. With any non-pre-paid carrier that is the case, but the amount you pay over time is included (some would say hidden) in the cost of the plan. The phone you mentioned costs $175. That’s a low cost overall, but many people are content to pay over time so the phone remains affordable.